Ah, the dreaded Blue Screen of Death (BSOD). It’s been around for many Windows versions now, and it always spells doom. 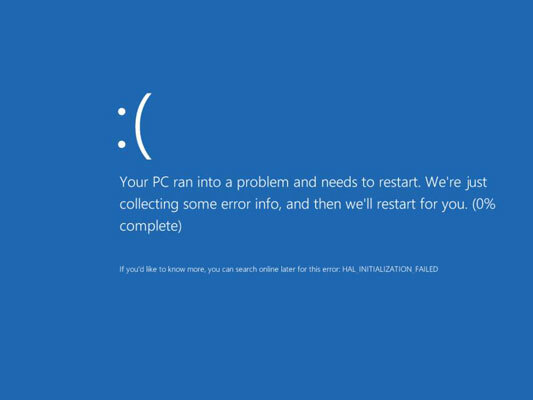 A BSOD is a serious error message that appears on a bright blue screen, letting you know that a problem has occurred that is so severe that Windows had to stop. After you read the error message (and probably can’t make heads or tails of it), your only recourse is to press the computer’s power button to shut it off, and then turn it back on again and hope the problem doesn’t reoccur. As of Windows 8, the error messages on the BSOD are somewhat less cryptic than they used to be. The figure shows one from Windows 8 that even has a smiley face on it (sort of). If you get one BSOD message, you can just ignore it. However, if you get the same message over and over (several times a week, for example), you should investigate the cause of it. BSOD message are often hardware-related; have you installed new hardware lately? Have you updated a device driver? Follow the advice in the error message and look up the error code online.